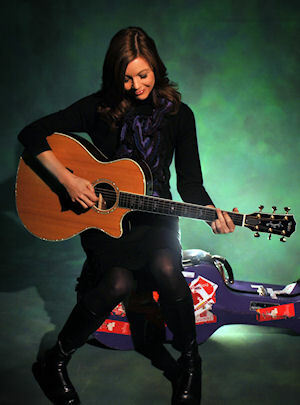 Carrie Newcomer writes music that speaks for those who journey down an accepting and grace-filled spiritual path. Her songs, at their best, are rich explorations of the nexus between the earthly and the divine. She stands with her feet planted in the fertile soil and rolling hills of Southern Indiana, but allows her essence to inhabit the dreamland of spiritual awakening where kindness, peace, equality, and grace abound. Newcomer has a new album out, Everything Is Everywhere. It’s a collaboration with three of the best sarod players in the world, Amjad Ali Khan and his sons, Amaan Ali Khan, and Ayaan Ali Khan. A sarod is an Indian instrument with between 20 and 25 strings, a goatskin head, a metal fretboard and a teak body. If I had to describe the sound, I’d say it’s like a cross between a sitar, a banjo, and a dobro. When I first heard about this collaboration, I was interested to find out how the very Eastern sound of the sarod would work with Newcomer’s folk compositions and the scales, timing, and structure she teases out of our own classical tradition. I wondered if the music of the sarod, thick with overtones that often feel discordant to untrained Western ears, might not require a different kind of aural processing, an extra step that could make it hard for many to find the beauty in the eccentricity of the sound. But Newcomer’s new album again illustrates that when the Spirit exhales in the presence of musicians intently listening to Her, cultural differences become utterly complementary. The album’s first song, “Breathe In, Breathe Out,” begins with a metallic sounding drone punctuated by Amjad’s sarod musings. The playing, loose and free, piques your interest. Moments later, the sarod foreshadows the vocal melody. Enter Jim Brock‘s percussion work. Here he crafts a beat that practically dares you to keep from bobbing your head. Thickly layered, chant-like vocals start. Ah, there’s the sound of a strumming guitar. The sarod solo now sounds familiar. And just like that, East meets West. It fits. It’s a Carrie Newcomer song, expanded in a way we’ve not heard before. Enter Carrie’s lead vocals, her lyrics inspired by the poem, “At Blackwater Pond,” by one of the great poets of our time, Mary Oliver. Now they’re off and running. I was hooked, and turned it up so I could hear the nuance of the mix. I think there could be radio airplay in this track’s future. I only hoped the rest of the album would live up to this opening. “Everything is Everywhere,” the next tune, maintains the sound – guitar and vocal with prominent sarod solos. Strings fill out the mix. Not lush sound stage strings, but solo strings, left sounding a little gritty to enhance the ethnic feel of the instrumentation. The lyrics speak eloquently of home and our connection as one of the species living here on this earth. We tend to think of India’s culture as being so far removed from our own – here in Indiana, here in the United States, here in the West. But Newcomer skillfully weaves scenes familiar, both here and there, and unites them in the belief that we can create the miracle of happiness everywhere. In this piece, the sarod nestles down softly into the strings at the end, underscoring the message of Carrie’s lyrics. “We Were Sleeping” marks a transition in the sound of the album. 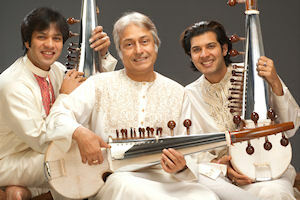 Eastern musical influence is provided by Amaan and Ayaan’s haunting vocals; the sarod is absent on this piece. Gary Walters’ piano moves forward and provides comfortable underpinning for the guitar and vocals. Though musically this song and the one following, “I Believe,” are less remarkable than some of the others on this album, the lyrics are the focal point for both. And they are stellar. Starting with “I Believe,” I was delighted to find that the sarod began to cut a distinctly bluegrass trace, which not only leaves the songs compelling and approachable but further underscores the virtuosity of the Kahns. The next two songs, “Shine” and “Dreaming,” could only appear at this point in the album. By now, you will find yourself prepared for them and ready to accept all they have to offer. The layered vocals are reminiscent of the wonderful vocal expressions of Moira Smiley (Moira’s group, Voco, is fabulous). The beat keeps you in your body, the frolic of the vocal arrangement tickles your heart, and once again Carrie has opened your soul to her lyrics that express something so welcome, so optimistically true it makes you feel delighted to be here. There is hope if we dare to sing along. Next we are treated to a gentle ballad, “Dreaming,” that is nothing less than the explanation of why “Shine” made you feel as good as it did. To me, this song paints a picture of what lies behind the veil. The lyric sheet says it was inspired by the writings of John O’Donohue. I think he must have been inspired by Genesis, but went about a block and a half further. Sometimes a song is so heart-achingly beautiful it feels like it came directly from Spirit. “Dreaming” is such a song. It seems to me Spirit is not only in the songwriting, but in the arrangement and production as well. David Weber and Chip Reardin have mixed the multi-layer, airy, backing vocals of Carrie and Malcolm Dalglish with such a deft touch they come off feeling like a single line lullaby. Gary Walters‘ piano is strikingly humble and restrained, allowing the song to breathe and expand. The percussion is perfectly conceptualized and placed. You hardly notice it, but it is the quiet stream that carries this message directly into your body. Every element of the song simply works. A gentle, inspiring, comforting expression of Truth. Just like her song, “Geodes,” on one of her earlier albums, The Geography of Light, it makes me cry. And the fields are filled with dust. With a hard act to follow, the next song, “Air and Smoke,” serves as fitting music for the few minutes you take to find yourself again after the emotional interaction of “Shine” and “Dreaming.” This is a characteristic Carrie Newcomer song, complete with excellent, hopeful lyrics of our coming together as a people. If you’ve heard her last few albums, “Air and Smoke” will sound comfortable to you. 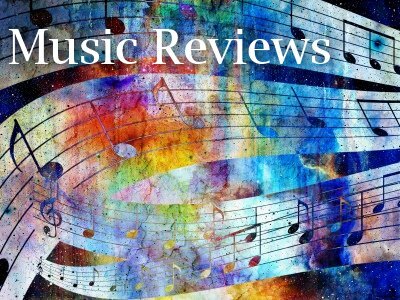 Amjad’s sarod leads move it away from the pack, but this song – though solid, well written, and well presented – is not what you will remember from this album. It is followed by “May We Be Released,” a piece that snakes back into your heart. I immediately thought of the friends for whom I wanted to play this song, mostly based on the excellent lyrics. It’s one of those songs that say something you’ve often wanted to say to someone but have never figured out how to do it. I wish I could reprint the entire lyric here because it’s just that good. I’ll just have to make do with a few lines that I think would make a good toast for the spiritual seeker. The things you thought were right. After “May We Be Released,” no more words are necessary. All has been said. And so, fittingly, the album ends with an instrumental, “Fountain of Love.” We are returned to the sound of India, the sound we were introduced to almost 45 minutes previously. Amjad Ali Kahn has created a new arrangement of a traditional Raga and here it is performed with excellent results by not only the Kahns but also the other musicians on the album. If you are a fan of Carrie Newcomer’s music, or if perhaps you simply have found yourself wandering down an accepting and grace-filled spiritual path, this music will appeal not only to your ears, but given half a chance, it will reach into your heart and make a home there. I think we like music that speaks for us. I often feel Carrie Newcomer’s music speaks for me. But after listening to this album many, many times, I realize that it doesn’t really speak for me as much as it speaks for all of us. Everything Is Everywhere defines the people we can someday become, and the loving Spirit we, as one people, will someday embody. 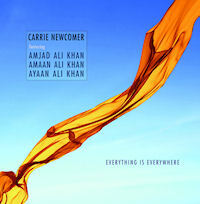 You can hear music from Everything Is Everywhere and purchase the CD on Carrie Newcomer’s website. All profits from CD sales will go to the the Interfaith Hunger Initiative. © 2011 by Evangelical & Ecumenical Women’s Caucus. Originally published in the Fall (October-December) 2011 issue of Christian Feminism Today, Volume 35, number 3. Everything is Everywhere lyrics © 2011 by Carrie Newcomer, used here by permission.